Preheat oven to 350. Spray 8x8 or 9x9 pan, set aside. Combine oats, spices and salt together; Set aside. In a separate bowl, whisk together then brown sugar, pumpkin, honey and vanilla til smooth. Mix the wet and dry ingredients together until all of the oats are moist. Evenly press oat mixture in the the bottom of the pan and bake for 30-40 minutes or until golden brown. Let them cool, then cut them using a sharp knife. I really enjoyed these! They came out soft and chewy. Depending on how you like your spices, you might want to tone down the allspice or the cloves. I thought these were great! Eat at home: ingredient spotlight PUMPKIN!! These sound really good and perfect for next month when the weather starts to turn. Jumping the gun to the fall with pupmkin? I'm looking forward to those flavours! Your bars look great! Perfect for the upcoming fall season. Looks delicious. Oh I love anything with pumpkin! I'm bookmarking these for the fall! These look so delish, and the fact that they're a healthy treat is just icing on the cake! These look like the perfect fall snack that the whole family will love. I just pinned it. I've been looking for a good chewy granola bar recipe. I'm excited to try these when I can finally find some pumpkin! 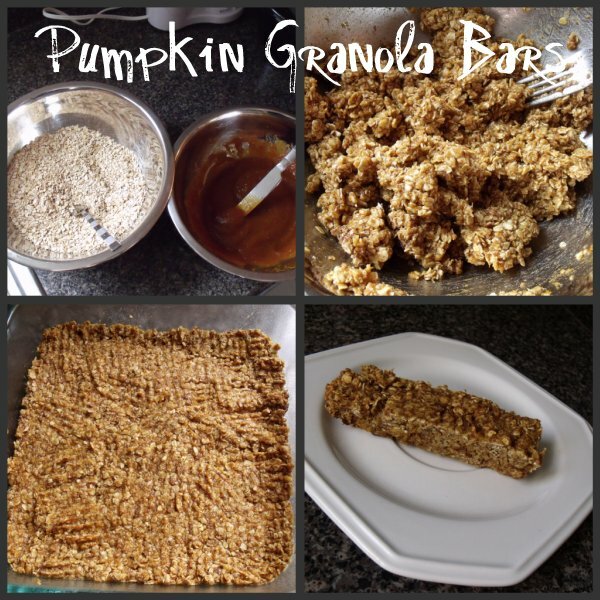 I've never made homemade granola bars, so how cool is that! Amazing! Great job! I am glad you enjoyed them. I love the way you cut them too. I cut my bars too big the first time I made them, lol. They are a fall favorite for me and the BF! :) Let me know how you like the pumpkin butter. I find it addicting! What a great Fall snack! Thanks for sharing! My grand daughter is going through a phase of not eating and these would be a healthy hand food to give her. Great SRC choice! ooo hubby is a Pumpkin Nut! haha he would be in LOVE with this! These look great, I can't wait for fall!! SCR is turning out to be lots of fun -- so many new recipes to try!